Offspeed Offerings and the Effects of Release Point | How Do I Baseball? Earlier in the week, Harry Pavlidis had an article in the WaPo breaking down the changeups featured by the Washington Nationals and a breakdown of each into one of four categories that evolved from whether the changeup generated lots of swings and misses (called a ‘whiffer’) or groundballs (a ‘grounder’). If a pitcher’s changeup did both, it was a ‘double threat’ pitch and a ‘no threat’ if the whiff and groundball rates generated by the pitch were sub par. It comes as no surprise to anyone who watches Nats games that Stephen Strasburg‘s changeup is a double threat and one that Pavlidis admits to arguably being the best in baseball. 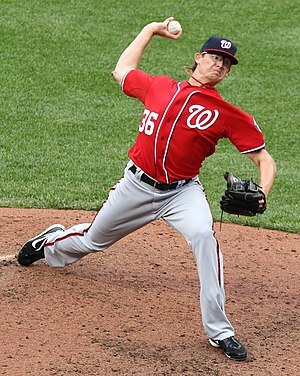 Also garnering high marks but ultimately labeled a grounder type of changeup was Tyler Clippard‘s change of speed, which he pairs with a fastball that he keeps up in the zone to get batters to produce a large number of strikeouts and flyballs. This pairing as well as the part of the strike zone Clippard lives in is not a common approach to get hitters out, but Clippard’s track record is plenty of proof that it can be effective. Getting back to the changeup, I had a look at the differences between Clippard’s and Strasburg’s changeup, looking for what made Stras’ a double threat and Clip’s just a grounder. Both fantastic pitches, but what was the secret to Strasburg’s offspeed success? While the velocity differences do show some significant disparity — Clippard’s changeup is of the ‘Bugs Bunny’ variety, with a ton of velocity bled off of it compared to his fastball, while Strasburg’s is closer to his fastball velocity, occasionally touching the low-90’s — perusing the PITCHf/x data of each brought to light another difference between the two elite Nats changeups. What each of these gifs shows is the overlay of the release points of each of the changeups and fourseam fastballs thrown by each pitcher in 2013. With Clippard, we see a bit of a disparity between the fastball and changeup release points, while with Strasburg, we see all pitches essentially coming out of the same arm slot — both pitches are leaving Strasburg’s hand at essentially the same spot every time, making it difficult for hitters to distinguish between the two, making the changeup even more effective. It isn’t until the hitter has committed to swing at what is believed to be a fastball that they realize it’s not a fastball, but a changeup. From there, the hitter is not only victim to the change of speed, but also the arm side tail and movement of the pitch that makes Stras’ changeup so devastating. While Clippard’s changeup is no slouch, we do see two relatively distinct clusters, which can possibly make his changeup a tad easier to pick up versus Strasburg’s. Could this tiny difference in release point be the difference between a good changeup — either a whiffer or a grounder — versus a double threat? Possibly. Yet, like with so many other aspects of pitching, there’s more than one way to do things and do them well, and with the two Nats pitchers discussed, we see a difference in philosophy and approach that leads to the same result — a bad swing from a confused hitter.